What does it mean to surrender everything to God? Sure, you hear pastors preach about it, we sing about it and even use it in conversations with other believers. It’s so easy to talk about surrendering, but how do we actually put it into practice? Upon doing some research for this post (which I came up with after a colleague asked me that very question, and I realized I needed a better understanding of this topic), I found a video of one Joyce Meyer’s messages on surrender. She says you can either surrender to the devil or surrender to God. That’s the choice. I think James 4:7 illustrates this point well. So when we’re surrendering to God, we are in essence, resisting the will of Satan. But back to my original question of how to surrender. Joyce Meyer describes surrendering as simply letting go. We stop fighting our circumstances, fighting ourselves and fighting all the things people to do us that we don’t like and fighting the place God has put us. We stop trying to everything our own way, letting God handle things instead. For one thing, it’s a lot less work, because God already has a plan, so why not just go ahead and let him do it? He’s going to accomplish His work either way. Take it from me — it is an exhausting way to live. But for so many years, that was exactly how I lived. There were things in my life that I had spent years praying for that still hadn’t happened — and I was pretty convinced God had accidentally left them off his to-do list. So what did I do? Try to do them myself, of course! And as you may have guessed, that method failed. I began this year with a 21-day fast that has in some ways changed the course of my spiritual walk. (If you’ve never fasted, I highly encourage it. I’ll be writing a post about it soon!) For me, that was the beginning of surrendering. Much of my journey this year has been mentally giving up trying to make things happen my own way, and just simply thanking God to be alive each day; thanking him for my family, friends, job and everything He’s given me. It’s resulted in an attitude change, which also feels a lot like surrendering. I’ve been focusing on staying in the Word and praying intentionally throughout the day every day (this includes starting each day in prayer, telling the Lord that I surrender the day to Him and asking to let His will be done, even in the small day-to-day things). It makes a difference. I’ve also worked on Bible verse memorization, although I’ve fallen off the wagon on this more recently. But it’s a great way to get God’s word in your mind and your heart. Ultimately, this year has been a fresh commitment to strive to live a God-honoring life. It’s consisted of sincere prayers and real honesty with God — some days, that has meant confessing that I’m mad at him. After all, if we can’t tell God how we really feel, what kind of relationship is that? He loves us through it all, and always directs us back on track. For me, surrender was a change in attitude toward God and life. More than anything, God is teaching me to be more thankful for what I have. And in turn, I have learned to love Him even more and see the beauty in all situations. I still don’t have it all figured out, but I can assure you of this: Despite what the world tells you, surrendering to God is the most freeing thing you’ll ever do. It is. God gives us joy, but we have to choose to receive it. You can choose to become consumed by your circumstances and wallow in them – looking primarily at the here and the now – or you can choose to look up to God, showing gratitude for all He’s done in your life and trusting that he is in control. That’s real joy. Joy is so much deeper than happiness. It’s not circumstantial. Happiness will come in your life, certainly, but it’ll also fade. Notice how you can be on a cloud one day and down in a ditch the next? Joy isn’t like that. It never fades. We can have it regardless of our circumstances. It comes from God and it lives deep within us. It’s an outcome of our relationship with the Lord, and it can give us strength to get through whatever we’re facing. One of my own tendencies is to allow others to control my joy. If they do something that makes me unhappy, frustrated or leaves me otherwise unsatisfied, I’m ready to throw the towel in. Ever been there? You have to consistently choose not to let others drag you down. Because believe me, if you let them, they will. When you depend on God, though, and believe He’s going to provide for your needs, it’s a lot easier to live in joy. You can choose to live joyfully, allowing God to direct your heart, or you can live in fear. It’s your own choice. But here’s the thing: You’re going to have to face your current situation regardless of what you decide. For me, joy usually starts with being thankful for what God has already given me. He has provided so much, yet I find myself continually looking at what I don’t have and what I still need. But when I focus on everything He’s done in my life so far, I’m just overwhelmed with thankfulness, and that leads to joy. Joy also begins with letting go of things I can’t control. This happened to me recently. I have been holding on to something so tightly – something that I want to be within my control, but it isn’t. I’ve been praying about it every day. And I don’t know how it happened, but one day I just woke up and wondered what would happen if I decided to give it to God, be happy and quit worrying about it. Can I just say, wow. I changed my attitude and God did the rest. He has given me so much joy and peace about it ever since. It’s not that the situation has gotten any easier. Nothing has changed around me. It’s just I have one less burden because I know my God can handle it much better than I ever could. The change happened in my heart, and it was all because I chose to let go and let God work. When we just trust him, he gives us unexplainable joy. What is it you need to lay at the feet of Jesus? He can give you joy beyond your circumstances. And he will, if you just pray to Him and trust that He’s got you in the palm of His hand. Someone has been unkind to you in the past, haven’t they? Maybe intentionally, maybe not. But we’ve all been hurt by someone. I’m sure you can recall exactly who it was and how they made you feel – and probably, what you wanted to say back, whether you said it or not. One of the hardest things we face as Christians is being Christ-like to those who, quite frankly, don’t deserve any kindness. Last week, I faced that very situation. Someone was extremely rude to me via text message. I am talking the kind of comments that are meant to purposely tear someone down and make them cry. That kind of unkind. I did not know this person very well, so it was hard to take the insults very seriously. Still, they were hurtful things that spoke directly to my own fears and insecurities. I know who I am in Christ, and a few intentionally mean comments aren’t going to change that. I’m a daughter of the King. He loves me, so why does it matter what someone else thinks? My initial reaction was to write a text telling him where to go. Really. I almost wrote those three words. Yes, I am still shocked at myself. At the time, I was busy and couldn’t respond immediately. It’s a good thing I didn’t, because then I felt the Holy Spirit speak to me. I felt that he wanted me to respond kindly, so I did. Wouldn’t Jesus do the same thing? If we’re kind to our enemies, God will bless us. This is so counter intuitive to our nature. But if we want the light of Jesus to shine through us, we have to live out Christ’s love daily. This means being kind to people who do not treat us with the same courtesy. I’m not saying you should let people walk all over you. There is a point at which we all need to stand up for ourselves. But I think there’s a way to still do that while letting the love of Christ shine through us. I agree the people who intentionally hurt us don’t deserve kindness or love. But how will they see Christ in us if we only love those who love us back? When Jesus lived and died on this earth, he was hated and persecuted by the very people he came to save. We didn’t deserve His love, but He gave it anyway. When we adopt this mindset in our actions toward others, we become a little more like Christ. In this life, we’re going to be faced with tough situations like this, but I believe the Lord tests us to see what we’ll do. In a way, I’m thankful He allows these things to happen, otherwise I wouldn’t have a chance to really let others see how He lives in me. And in the process, God continues to show that nothing could change His love for me or you. When God finally does something amazing in our lives, there are no words to describe how good He truly is. When he shows up, he really shows up. But here’s the thing. I don’t know about you, but I have this misconception that once God finally answers a long-awaited prayer, that’s it! Everything is going to be perfect. Or at least as close to perfect as you can get. Except it isn’t very long after I get “the thing” that I realize something – this thing comes with challenges all its own. Well, darn it. I just climbed one mountain. Now I have to go up another one? And suddenly, there I am again, standing at the bottom of a mountain I cannot possibly climb. Once again, as I’m rendered helpless, I fall on my knees, realizing just how much I need a great big God. Not that I ever didn’t. It’s then I must come to terms with something: I may never arrive at my “destination” here on this earth. It’s all a journey. While the mountains we face look impossible, God can make a way even when there doesn’t appear to be one. He can give us the strength to do it. We may be at the bottom of a mountain, but we don’t have to climb it alone. I don’t know how we could. When we need strength, Jesus is there to pull us along. Some days he even picks us up and carries us. And have you noticed how when you fix your eyes on God instead of the situation you’re facing, that mountain starts to shrink? God allows trials to come into our lives not only so we grow in our faith, but so He can show us His goodness and grace along the way. I encourage you to pray for peace, strength and wisdom to see beyond the four narrow walls we tend to build around our situations. Pray that the Lord would help you see the bigger picture. He knows the future, and it will all come together for His glory if you follow Him. And you know what happens after we get through it? We have a testimony! And that, my friends, is the most powerful thing of all. Growing up, I never had much of an interest in sports or athletics because, truth be told, I never felt I was good at it. Unless you count my mom’s cheesy ’80s Jane Fonda workout videos I sometimes did in high school. Don’t laugh. It was some serious calorie burning. But I’m proud to say I’ve come a bit farther in recent years – now I run several times a week. I actually enjoy it, for the most part! And I’m proud to share that over the weekend, I completed my fourth 5K, the Firefly Run, with my best time yet. My sister Meghan did it with me. That’s her in the picture, by the way. Unlike my last few 5Ks where I ended up in the back with all the strollers, dogs and walkers, I actually started in the front this time. That helped improve my time, I think, but I felt like I was just keeping up. They were all passing me! A few times, I did actually pass some people. I felt a little better about myself after that. But this isn’t just any 5K, people. First, it’s at nighttime, which I love because that means no early morning wake-up call. But the best part is all the beautiful lights that sparkle through the streets. Think all the crazy, blingy, glow attire – bracelets, headbands, sunglasses, Mickey Mouse ears, you name it. From an aerial view, I have to guess it would really look like fireflies. 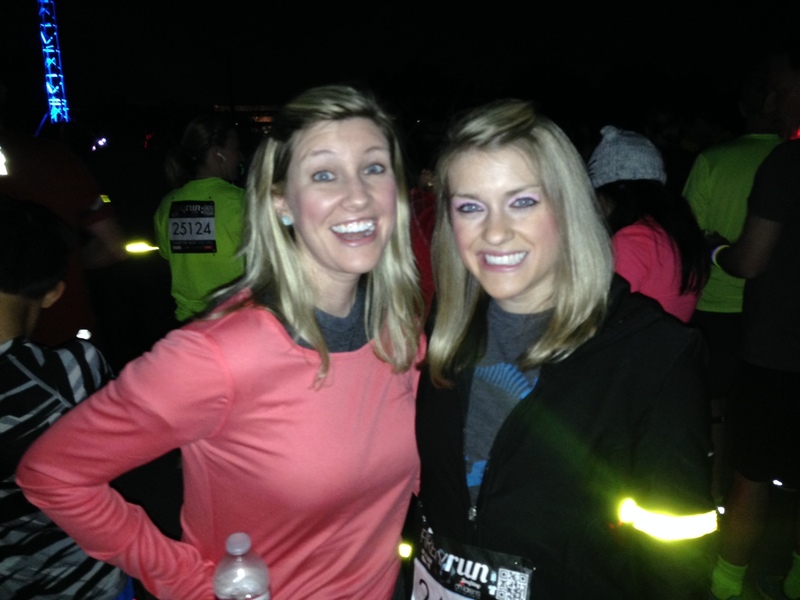 Imagine if we all let the light of Jesus shine through us – in a figurative sense, it would look a lot like that 5K. I think too many of us, myself included, don’t always let our light shine as brightly as we should. But just like the nighttime, we live in a dark world. A world that desperately needs the light of Jesus. He is our only hope. And I’m sure it goes without saying that far too many people in this world don’t know Jesus or His love for them. It’s so big. It changes who we are from the inside out. It forgives us, sets us free from our past and gives us new hope. When we live a life following Jesus, we live in complete freedom! If more of us let our light shine, even just a little brighter, think of the difference we could make for the Lord’s kingdom. Sometimes “letting your light shine” is as simple as showing kindness to others, keeping a positive attitude at work or school or perhaps going out of your way to help someone. I think that’s where the phrase from the verse “good deeds” plays in. Other times it’s witnessing to a friend, family member, coworker or even stranger who doesn’t know Jesus. I also believe when we’re truly seeking Christ and living a life set on Him, that light will be shining – it’s simply a reflection of what’s already inside our heart. And friends, when you know the love of Jesus, that’s hard to keep inside. Anyone with me here? We all lead busier lives than ever, and we all have our own problems to deal with. But don’t get so distracted by trivial day-to-day problems that you forget to share Christ with others. This one life is all we get. Don’t let it flash by without letting your light shine.